At Huston-Tillotson, she created a set of principles called IDEAL (Integrity, Diversity, Excellence, Accountability, Leadership) to guide all things and people of Huston-Tillotson, from operation to students to faculty and staff. 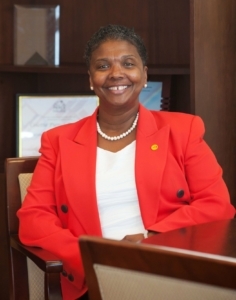 At Huston-Tillotson, she inspires over 1100 students and over 100 faculty and staff members. Partnerships are being created such as Texas Wildlife and Parks and Merck and Company and first-time internships for students such as PayPal and local software company Planview. Before becoming a university president, Dr. Burnette was a successful engineer with widely-known organizations. From being a computer analyst for The Washington Post to an operations support engineer for Proctor and Gamble, from Director of Information Systems at Neighborhood Reinvestment Corporation to Manager of Consulting and Project Management Services at the Washington State Department of Transportation, and ultimately, running her own computer consulting firm, it is no surprise that her alma mater, the Ohio State University named her Outstanding Engineering Alumnus. More honors reward Dr. Burnette for her years of dedicated service: United States Army Distinguished Civilian Volunteer Service Medal Award, Thurgood Marshall Foundation Chief Information Officer of the Year Award, Outstanding Student Advocate Award, Inductee into the Austin Women’s Hall of Fame, Dayton Business Journal Chief Fiscal Officer of the Year Award, and the National Diversity Council Glass Ceiling Award, to name only a few. For someone of Dr. Burntte’s caliber and with her breadth of knowledge, many boards want her membership. A few of her current local board memberships include the Mayor of Austin’s taskforce on Institutional Racism and Systemic Inequities, Girl Scouts of Central Texas, and Greater Austin Black and Austin Area Chamber of Commerces. Nationally, she serves on The Ohio State University’s College of Engineering Advisory Committee and the National Association of Schools and Colleges of the United Methodist Church Board. Dr. Burnette is a member of Delta Sigma Theta Sorority, Inc., Austin (TX) Chapter of The Links, Inc., the National Society of Black Engineers, and Texnikoi Engineering Honorary. In addition to sharing her rewarding life with her Huston-Tillotson family, she is the wife of Daarel (Retired Lieutenant Colonel) and the mother of Daarel II of Washington, D.C. and Daana of New York, NY.